If a journalist uses the search engines to search for a source with your expertise, Google may return to her a long list of possibilities on the left side of the screen. There’s a clever trick you can use to prod that journalist into picking up the phone and calling you—even if she’s on deadline and she doesn’t have time to review each website one by one. When I discovered this trick, it was one of those “duh” moments. I slapped my forehead, and yelled “Of course!” I was embarrassed that I hadn’t been doing this. This trick works just as well if you’re trying to encourage potential customers and clients, joint venture partners, book buyers, meeting planners looking for speakers, or anyone else to call YOU instead of your competitors. Get a prospect on the phone and they’re as good as closed. 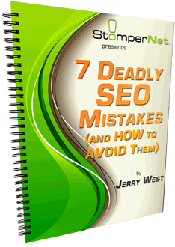 This is Mistake #3 in the complimentary email course “7 Deadly SEO Mistakes” from StomperNet. Each email lesson, delivered over seven days, is a quick read. If you don’t like getting your hands dirty with this technical stuff, forward the lessons to whoever manages your website. Better yet, read these tips, and then see how many of the mistakes your webmaster is making.